Hangzhou No.4 High School Symphonic Winds Conductor: Ms. Bei Jin Hangzhou No.4 High School boasts its symphonic wind band formed in 2010 and dating back from its initial band in 1998. Our band, a branch of Hangzhou High school Arts Troupe, has more than 60 members with scientific training, strict regulations and perfect facilities to stimulate students’ advanced performance.The ensemble has won the gold medal in 18th World Music Contest which held in Kerkrade, Netherlands 2017. 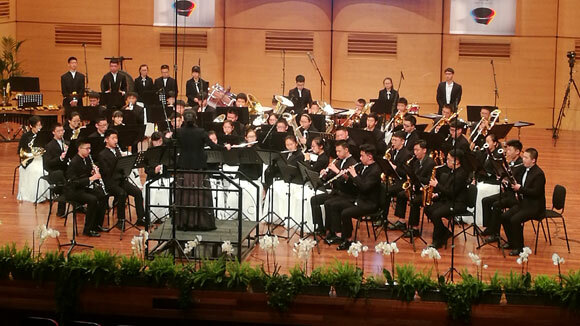 Thanks to the substantial support from several arts troupes and specialized guidance, such as Zhejiang Symphony Orchestra, Hangzhou Philharmonic Orchestra, Zhejiang Conservatory of Music, No.4 High School Symphonic Winds has now been the top within the field of high school symphonic winds in Hangzhou. Mr. Zhipei Liu, a famous Chinese-Canadian conductor and appointed as Art Director in Symphony Orchestra of Zhejiang Conservatory of Music, is the key to our tremendous development. He often visits our school to give professional guidance. Since 1998, we have had the privilege to perform in Hangzhou Grand Theatre, Zhejiang Music Hall, Hangzhou Music Hall as well as in local communities and primary schools voluntarily. Various competitions are part of the activities and the results always come to the top prize no matter in Hangzhou or Zhejiang Art Festivals. Besides, foreign exchange is of great necessity for development for both the band and members within. Not only does our school benefit from the great achievement of the band but some members have been recruited into top universities or art-oriented ones in China, for instance, Zhejiang University, Communication University of China, East China Normal University, Beijing Institute of Technology, Shanghai Conservatory Of Music, Art College of the Chinese People s Liberation Army, Xinghai Conservatory of Music, The Zhejiang School of music, Zhejiang University of Media and Communications. Therefore, Hangzhou No.4 High School Symphonic Winds offers a stage where musical lovers can fully show themselves and also domain where students can be well nurtured. Conductor Ms. Bei Jin’s Personal Introduction: Ms. Bei Jin graduating from Hangzhou Normal University music department with B. A in music education once served an apprenticeship to local famous piano professionals such as Ms. Jiefang Mao and Mr. Zhixin Cai. She has received further professional training programs organized in Zhejiang and nationwide. In 2013 she attended Stringer International Conductor Master Training Program. Ms. Jin is now a teacher with senior teacher certificate in Hangzhou No.4 High School and appointed as conductor of a branch of Hangzhou High School Art Troupe. 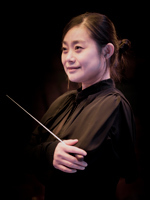 As a teacher blessed with great musical talent, she has been awarded many times both for herself and Hangzhou No.4 High School Symphonic Winds’ performance, especially the latter winning first prize of Zhejiang and Hangzhou High School Art Festival for three consecutive years and herself as Best Conductor Award. Apart from those numerous awards listed in above Achievements and Activities column, many students trained by her also have won top prizes of musical instruments competitions in Hangzhou and Zhejiang. As a teacher, her achievements within music class teaching are fruitful, like first prize of Hangzhou Middle and Primary Music Class under New Curriculum System Contest and second prize of Hangzhou Music Class Teaching Design Contest.